We have a pretty big coffee table in our family room and recently I cleaned out the bottom part of it. I normally don’t decorate this table with any fall decor, but I really wanted to this year. 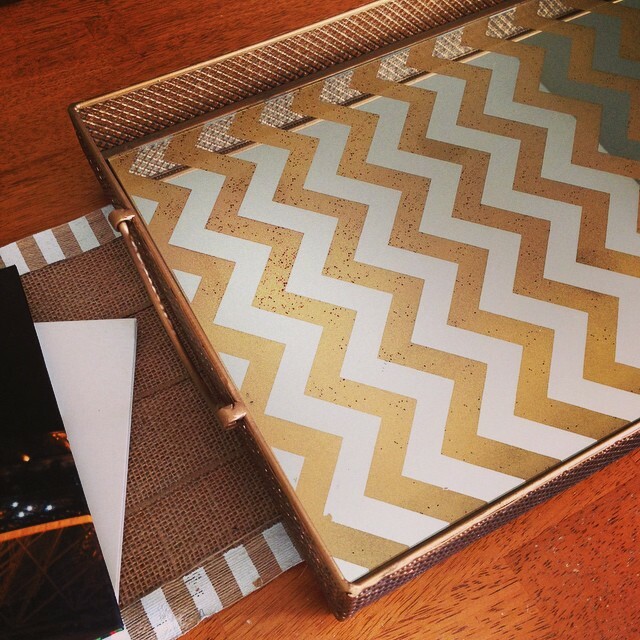 I found a beautiful chevron mirror tray in gold at Hobby Lobby (for 50% off!) 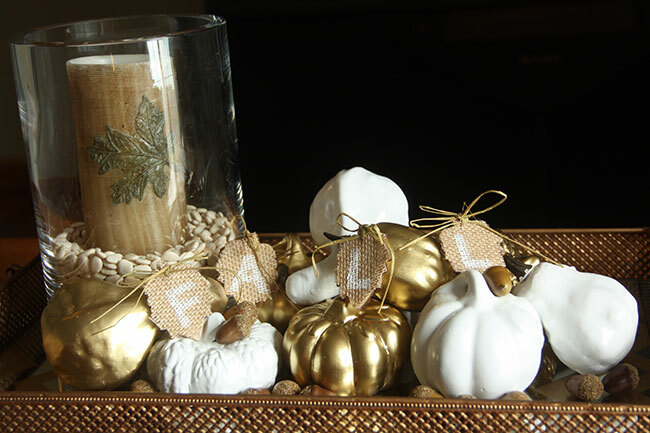 and decided to place a large pillar candle holder inside it with ceramic pumpkins in white and gold surrounding it. Of course, I added a few other details while decorating it and I am pleased with how it turned out! I had made a burlap strip runner (see instructions HERE) for the coffee table a year ago and decided to place the gold tray over it. I went into Dollar Tree to look for some ceramic pumpkins. 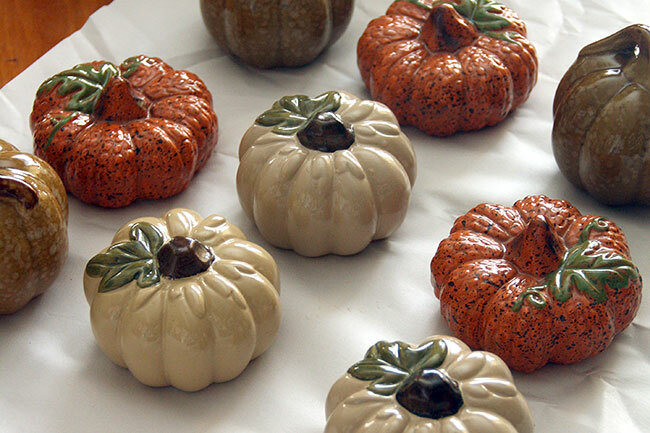 I found these ugly ones for $1 each… I knew I wanted neutral pumpkins, these colors weren’t going to work for me. Nothing that a little spray paint can’t fix, right? White ceramic pumpkins at craft stores are at least $3.99 each, so these were a steal!! 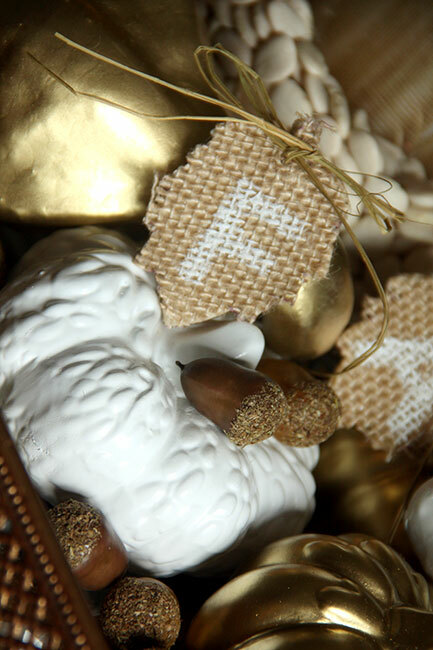 Little details like decorative objects really set the style. We sometimes display these on a side table also. 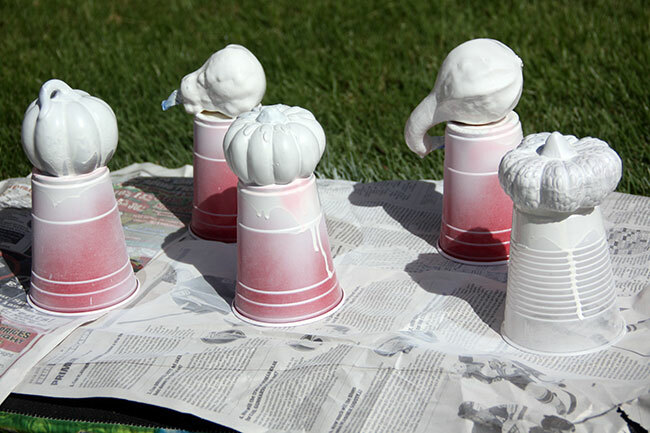 Spray painting the pumpkins… I also found a box of gourds at Hobby Lobby for 40% off that I decided to spray paint. 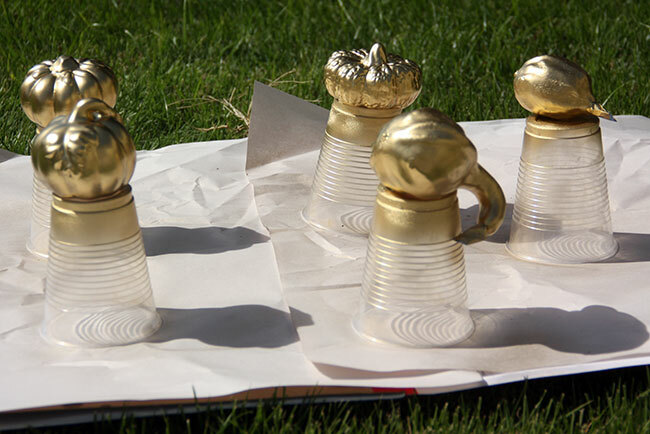 This was after the first layer of spray paint… I used 3 coats. When I was strolling the fall aisles in Hobby Lobby I saw these burlap covered wooden leaves for only $2 (with an additional 40% off). The package came with four leaves, just enough to spell out F-A-L-L! I have little rubber stampers and I stamped each letter in white paint on each leaf. 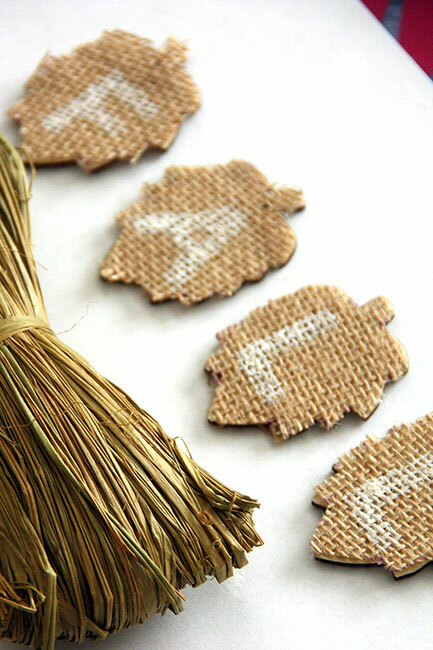 I then stuck a little strand of green raffia through the hole on the top of each leaf and made it into a bow. 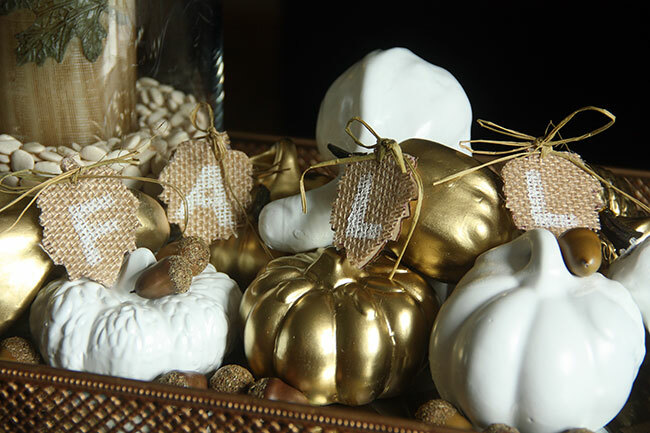 I placed the letters on top of the pumpkins and gourds in the centerpiece. I really love how it turned out! I was cleaning out my kitchen cabinets earlier this week and found this beautiful glass pillar candle holder from Pottery Barn. The price tag said $35 on the bottom of it and I can’t believe it was collecting dust under the sink and I had forgotten about it! I am so glad I found a place for it! 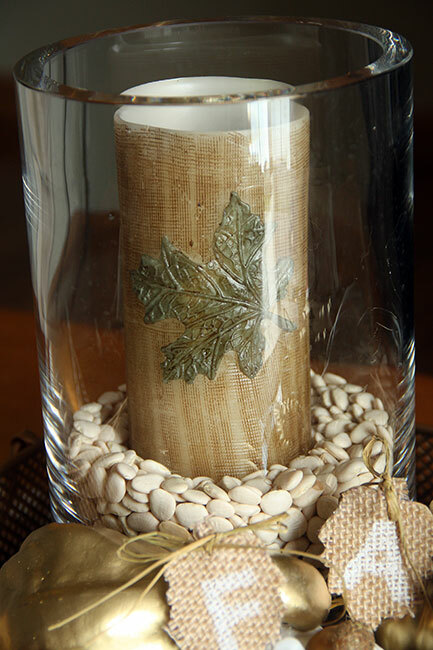 I was going to use a white pillar candle, but decided to buy this flame-less candle from Hobby Lobby that has burlap texture on it and a green leaf. 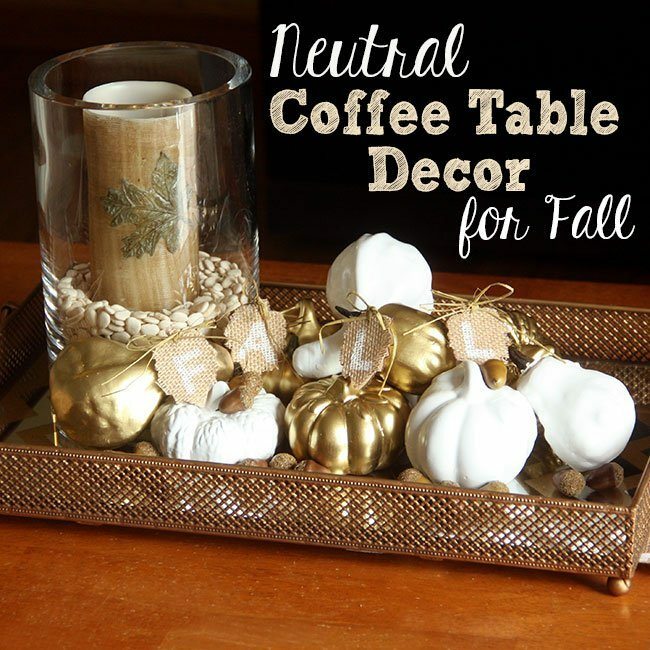 The neutral colors go seamlessly with the rest of the centerpiece. I poured white beans around the candle, which gives it a more natural look. 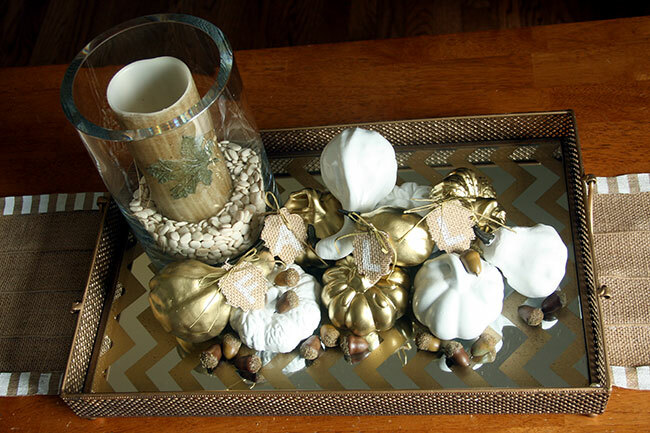 And, here you go… the completed gold tray filled with several neutral fall goodies! 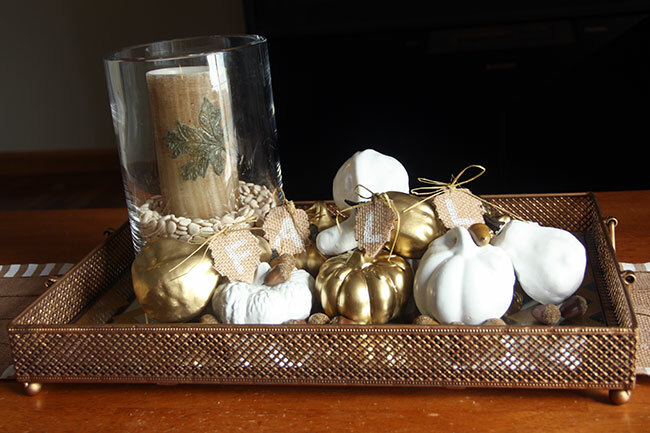 I also sprinkled some faux acorns around the bottom and placed a few on top of some of the pumpkins and gourds. In this photo you can see how well the tray goes with the burlap runner that is underneath. 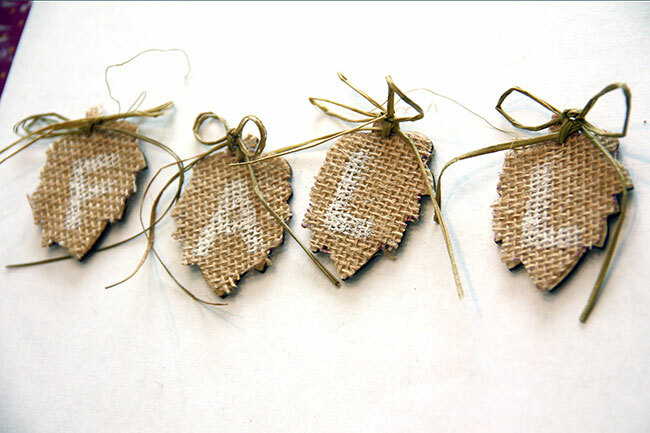 Here is a close up of one of the burlap letters and it also gives you a glimpse of the acorns. 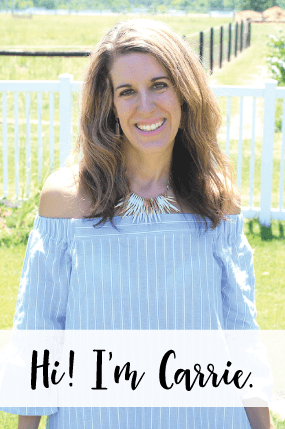 This will probably be my last fall project (besides my fall home tour, which will be coming in October)… once September wraps up, I like to start working on some Halloween crafts and decorations during the month of October!! What are you looking forward to working on this October? And, what happened to September? I always think that October is one of the busier/crazy/hectic months out there, right up there with December and Christmas! !